Puntos Necesarios: 4400 Tenga en cuenta que, de momento, no se puede descargar contenido de nuestra plataforma directamente en un dispositivo móvil (teléfono, iPod, iPad, tabletas ...). Necesitas descargar sus artículos en un PC o Mac y, a continuación, transferirlos a su dispositivo de forma normal. Estamos trabajando para permitir que las descargas directas a los dispositivos móviles, pero esto no es posible en la versión actual de la plataforma. Perdón por las molestias! NOTICE: Requires the base game BioShock Infinite in order to play. Activation key must be used on a valid Steam account, requires internet connection. This pack is included in the BioShock Infinite Season Pass and will contain new Achievements.ABOUT THE GAMECome back to Rapture in a story that brings Booker and Elizabeth to the underwater city on the eve of its fall from grace. 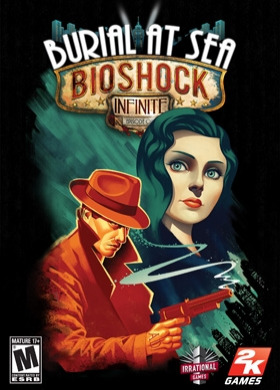 Developed by Irrati… onal Games, the studio behind the original BioShock and BioShock Infinite, this DLC features Rapture as you’ve never seen it before—a shining jewel at the bottom of the ocean, built almost entirely from scratch in the BioShock Infinite engine. The combat experience has been rebalanced and reworked with a greater emphasis on stealth and resource management to give the player a combat experience that merges the best parts of BioShock and BioShock Infinite. It includes a new weapon, an old favorite weapon from the original BioShock as well as the return of the weapon wheel, a new Plasmid, new Gear and Tears. SYSTEM REQUIREMENTS Minimum OS: Windows Vista Service Pack 2 32-bit Processor: Intel Core 2 DUO 2.4 GHz / AMD Athlon X2 2.7 GHz Memory: 2 GB Hard Drive: 20 GB free Video Card: DirectX10 Compatible ATI Radeon HD 3870 / NVIDIA 8800 GT / Intel HD 3000 Integrated Graphics Video Card Memory: 512 MB Sound Card: DirectX Compatible Recommended OS: Windows 7 Service Pack 1 64-bit Processor: Quad Core Processor Memory: 4 GB Hard Drive: 30 GB free Video Card: DirectX11 Compatible, AMD Radeon HD 6950 / NVIDIA GeForce GTX 560 Video Card Memory: 1024 MB Sound Card: DirectX CompatibleOTHER REQUIREMENTS & SUPPORTS Initial installation requires one-time broadband internet connection for Steam authentication and Platform Update For Windows Vista (KB 971644 required on Vista only for DirectX 11); software installations required (included with the game) include Steam Client, Microsoft DirectX Runtime, Microsoft Visual C++ Redistributable 2008 SP1, and Microsoft Visual C++ Redistributable 2010 SP1. © 2002-2013 Take-Two Interactive Software, Inc. Take-Two Interactive Software, Inc., 2K, 2K Games, Irrational Games, BioShock, and BioShock Infinite, and their respective logos are trademarks of Take-Two Interactive Software, Inc. All other marks are property of their respective owners. All Rights Reserved.The content of this videogame is fictional and is not intended to represent or depict an actual record of the events, persons, locations, or entities in the game’s setting. The makers and publishers of this videogame do not in any way endorse, condone, or encourage engaging in any conduct depicted in this videogame.